Before we share today's Inspiration Friday post, we want to let you know that the MFT Boutique, Warehouse and Customer Service will be closed from Saturday, September 9th to Monday, September 11th due to Hurricane Irma. We will reopen on Tuesday September 12th, weather permitting. Sometimes the perfect way to say hello is to simply hug it out. Hugs are affordable, never expire and are always one size fits all. Hugs let you say how you're feeling without saying a word. And when the miles are long, a virtual hug with a handmade card can truly brighten someone's day - handmade hugs are always in style. 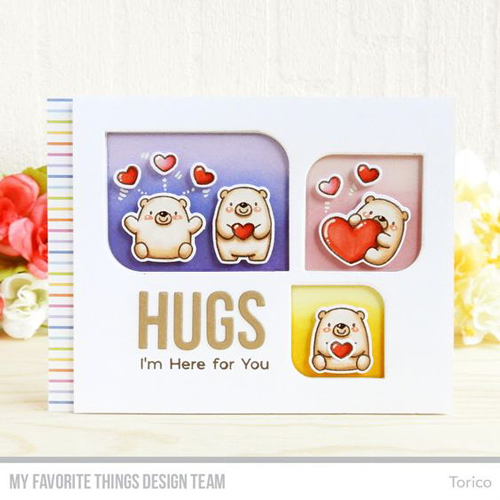 If you like to hug it out, be sure to tag your projects with #mftstamps so we can see what you're creating — you might just be spotted! Hope everyone stays safe up there. I am down in Broward county with my entire family here. Hunker down, be safe and see you in a few days!!! <3 Hugs!! Be SAFE MFT! Hopefully, Irma will have lost some of it's intensity as it travels its path northward in Florida. My thoughts and prayers are with you! Oh please be safe! My thoughts and prayers are with you! Take good care and stay safe everyone! Prayers for you and your families, and all those in Florida. Hopefully you all have somewhere safe to be. Will be watching and praying. Have many family members hunkered down and sheltering in place in Florida. Be safe. Please know many of us are praying for you all.